Summer is over and now it’s up to you to bring the heat. For the next 30 days, we’ll be providing you with prompts on the @AdobeStudents Instagram that are designed to ignite your creative spark and teach you some new skills along the way. We’ll also be giving out some incredible prizes at the end of the month, including a 13-inch MacBook Pro. 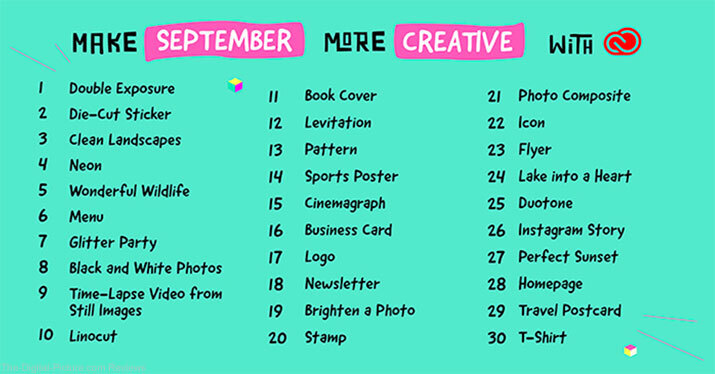 A new prompt will be shared every day of September on the @AdobeStudents Instagram and we are challenging you to complete as many as possible using tools from Adobe Creative Cloud. Don’t worry if you haven’t used them before, you can download a free 7-day trial here and complete any of the prompts for a chance to win. See below for further details on prizes and sweepstakes eligibility. We can’t wait to see the amazing work you create, so be sure to share all of your work on Instagram by October 1, 2018 by tagging @AdobeStudents and using hashtags #AdobeStudents30 #Sweepstakes. This challenge is all about building a creative routine, not about creating perfect work. All of these prompts are designed to be completed within 30-minutes. Whether you consider yourself a beginner or an expert, all we ask is you give your best effort! It’s time to get creative, get excited and most of all, enjoy 30 days of sharing your creativity with the world. No purchase necessary. All entries must be submitted by October 1, 2018. Must be 18+ and a current or recently graduated student (2018 onwards). For complete details, eligible countries, and promotional item descriptions, see official rules. Void where prohibited. Winners will be announced by November 1st, 2018.